Vivi Mayhem receives that cryptic warning from a strange wizard in an even stranger dream where she follows a white raven through a jumble of bewildering events. But a dream is never just a dream for someone with Vivi's gift of prophecy. When an old nemesis requests her help locating a missing wizard aptly named Devlin Strange, Vivi is dragged into a cat-and-mouse game to obtain a magical artifact that could alter the balance of power in Everland forever. It's a request Vivi can't refuse. If that weren't enough to turn Vivi's world upside down, the Mayhem sisters receive a visit from their great-aunties, who bring a little mayhem of their own in the form of enchanted heirlooms and clues to some long-held family secrets. After Honora uncovers troubling information about a newcomer to the Witch Council and Hex Division crashes a tea party at Clover's house, Vivi realizes that the Red Queen is even more dangerous than she thought. The Mayhem witches must bond together in a coven vs. coven battle to return the artifact to the council's safekeeping before it gets into the wrong hands. 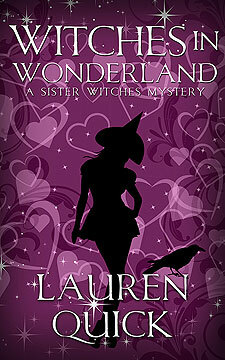 Magic and mayhem are brewing in Witches in Wonderland, a paranormal mystery that dares you to follow the white raven.